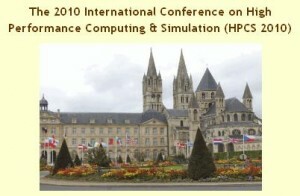 The following call for papers for the 2010 High Performance Computing & Simulation Conference in Caen, Normandy could be of interest for the members of our community. You are cordially invited to participate in this conference through paper submission, a workshop or a special session organization, a tutorial, an invited speech, a demo, a poster, an exhibit, a panel discussion, a doctoral dissertation, whichever sounds more appropriate and convenient to you. The conference will include invited presentations by experts from academia, industry, and government as well as contributed paper presentations describing original work on the current state of research in high performance and large scale computing systems, their use in modeling and simulation, their design, performance and use, and their applications. There will also be tutorial sessions, workshops, special sessions, demos, posters, panel discussions, doctoral consortium, and exhibits. Conference sponsorships are welcomed. In addition to papers, we welcome proposals for tutorials, demos, doctoral dissertation papers, panels or forums, posters, exhibits, sponsorships, industry track papers, etc. For further details and updates, please consult the conference web site at URL: http://cisedu.us/cis/hpcs/10/main/callForPapers.jsp, or contact one of the organizers.